What kind of Christian is Bill Shorten? Both the Prime Minister and the Opposition Leader describe themselves as believing Christians. Malcolm Turnbull was raised a Protestant, but, in his 40s, became a Catholic; Bill Shorten was raised a Catholic, but, in his 40s, became a Protestant. What have been the key religious influences upon them? To what extent is their faith reflected in their politics? For all but the very rich, there used to be three verities of a Catholic upbringing in Australia: go to mass, join a union, support Labor. Shorten, born in 1967, complied dutifully. Ann also ensured that her sons attended Catholic schools – St Mary’s Catholic primary school in East Malvern, followed by the prestigious Xavier College in Kew. Xavier College is the Melbourne equivalent of St Ignatius (Riverview), Tony Abbott’s alma mater in Sydney. There appears no doubt that Xavier College was a formative influence on the teenage Shorten. He was never especially devout, nor much interested in theology, but he took away one core message. This is evident from his recent campaign book, For the Common Good, which begins and ends with proud reference to Jesuit teachings. Such self-serving electioneering tomes must be treated with caution, of course. But it was an interesting choice for a left-wing leader in 2016. Shorten laid emphasis on the stirring injunction of Spanish priest Pedro Arrupe: “be men and women for others”. It is fact of Australian history that such messages – the whole edifice of Catholic social justice teaching – have long been influential within the Labor Party, especially for those of Irish working-class heritage. In this tradition, the Beatitudes and Matthew 25 are paramount passages. 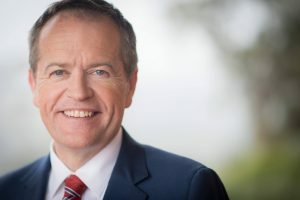 Shorten stands in a line of Labor Prime Ministers who were Catholic born and raised, from Jim Scullin through Ben Chifley, John Curtin, Paul Keating and Kevin Rudd. Only Scullin, Chifley and Keating stayed in the church of their birth. Shorten has followed the path of Curtin and Rudd, by converting as an adult to a form of liberal Protestantism. In Shorten’s case there were two inter-related factors. First, in 2008-09, he wished to obtain a divorce and then re-marry. His first marriage, to Debbie Beale in 2000, had been conducted under Catholic rites and was thus indissoluble in his Church’s eyes. Chloe Bryce (who became his second wife in November 2009) was an Anglican. Second, in his own words, he “had come to disagree with the Church on a number of issues: stem-cell research, the right of women to control their own bodies, priestly marriage, and, more lately, marriage equality.” He might have added divorce and re-marriage. In a speech to the Australian Christian Lobby in 2014 – worth reading in full – Shorten revealed a hitherto unappreciated religious side. He quoted Jesus, Pope Francis, Martin Luther King and John Wesley. And he argued that “for Australians of faith, religion is a base to build upon in public life”. In the same speech he also said: “I am a Christian and a supporter of marriage equality under the law”. Few evangelicals will find his reasoning persuasive, but, at least on that day, Shorten spoke respectfully about alternative points of view. He has also fought internally to ensure that federal Labor MPs retain a conscience vote until 2019, by which time it looks inevitable the matter will be decided. More recently, during the 2016 campaign, Shorten has promised if elected to preserve the current exemptions for religious institutions in Commonwealth anti-discrimination laws, and the saying of the Lord’s Prayer before each sitting day of Parliament. Read about Malcolm Turnbull’s Christian faith, here. Roy Williams is the author of In God They Trust? The religious beliefs of Australia’s prime ministers 1901-2013 (Bible Society, 2013) and Post-God Nation? How religion fell off the radar in Australia … and what might be done to get it back on (ABC Books, 2015).